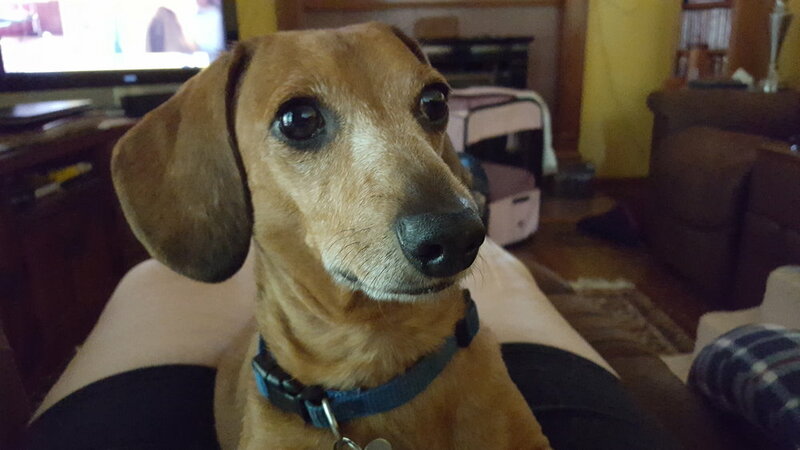 In February of 2015, we lost our doxie, Bosley. He had been our son for 13 years and his passing left an emptiness in our life. 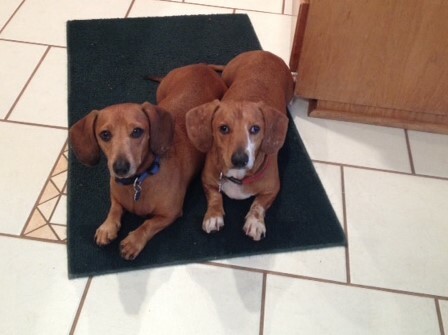 My husband and I were determined not to rush into adopting another dog, but in November we happened to see a picture of two dachshund brothers, Jamis and Arlie, on Facebook that were up for adoption at Chapman’s Dachshund Rescue and our hearts opened up to these two sweethearts. We contacted Chapman’s and made arrangements to travel to York, SC to adopt our new sons. Unfortunately, a couple of days later, my husband’s mother passed away and we weren’t sure when we would be able to get the boys. Chapman’s was willing to hold them for us, so on Thanksgiving Day we finally headed to Chapman’s to meet our boys. On November 29, we drove to the rescue which was abound with lots of noisy, but happy, dachshunds of all shapes, colors and types. Gina Chapman met us and introduced us to a handsome red dapple doxie named Jamis and his sweet brother, also a red shorthair, named Arlie. Gina gave us a large crate, and soon we were off to my cousin’s home, about an hour away, for the night and on to Syracuse and home the following day. Jamis and Arlie were five years old when we adopted them and had come from a home in Utah. Their owner was elderly and had to be put in a residential facility that did not take dogs. Her family took the dogs to their home in Fayetteville, NC, but did not want to keep them. Gina Chapman came to the rescue and took them to her facility about two weeks before we adopted them. Upon arrival at our home, the boys were very happy to see we had a large fenced-in yard, and proceeded to check out the critters who stood no chance against the doxie hunters. In the months that followed, they became an integral part of our family and friends. Jamis’ high-pitched scream and Arlie’s “talking” became a daily occurrence whenever we returned from a few hours away from the house. In late October of the next year, Arlie began walking unsteadily with his back end seemingly weak. We took him to our vet who stated that we should either take him to Cornell or the Veterinary Medical Center of Central New York. When she said that, it brought back memories of a problem our Bosley had, so we felt time was critical so we took him to VMC. He was admitted that evening and after a few hours he was unable to walk at all. Dr. Robinson, who had operated on Bosley in 2004, diagnosed that Arlie had a herniated disc and proceeded to operate. After a couple of days, we were able to take our little man home and begin home therapy. My husband and I learned how to express his bladder and perform leg exercises. In the next few weeks and months, we also took him for acupuncture and physical therapy with Dr. Fleckenstein and Lis at Care Pet Therapy. After a few months of therapy he was almost back to normal, running and chasing any animal that dared to enter our yard. In June of 2017, we noticed that Arlie had again started to walk oddly. We thought maybe he had just hurt his leg when running, but in a couple of days we knew that something more serious was happening. Dachshunds are notorious for racing down steps and jumping off couches and beds, thinking themselves invincible. This time we weren’t waiting, and went to the VMC right away. After examination, Arlie was diagnosed with a slipped disc, and once again needed surgery. Dr. Robinson was quite surprised that he had a disc injury again, as it was extremely rare but not unheard of. So once again, Arlie began a regimen of acupuncture and therapy, which continues to this day. However, he is a strong fighter and although his gait is still a bit wobbly, he handles it like a champ. My husband carries him up and down stairs, we watch him relentlessly so that he doesn’t jump off the couch. When he needs his alone time, we also have a playpen set up with lots of soft blankets in our family room. Arlie never ceases to amaze us with his attitude. Although he has endured much pain and hardship in his short life of seven years, he takes his handicap in stride and achieves a quality of life on his own terms. When he is tired, he rests; when he is happy, his tail wags like a propeller; and when he needs something, he “talks” until we figure out what he wants. And when he cuddles with us and he looks at us with his big brown eyes, no words are sufficient or necessary. We love him with all of our heart, and look forward to many happy years with him and Jamis.